Let’s face it, no one enjoys dosing their aquariums. It’s easy to forget to dose, and even easier to add too much or too little fertilizer when you do dose. Using a few parts that you may already have lying around, building an autodoser to simplify this task is easy to do. While there are commercial systems out there, most of them are more expensive than this unit, and will not last as long without intervention. Depending on the pump that you are using you may need a variety of tubing or reducers. I find that a syringe works well for connecting the pump to 3/16 or 1/4 diameter tubing. Get the container in the spot where it will ultimately reside. Connect tubing to the pump so that it is long enough to reach from the pump to the rim of the aquarium. You can add some sort of nozzle to the end of the tubing; I used the little union connectors for mini airline tubing, and your binder clips to secure it to the rim of the aquarium. Cut a hole into the lid of the container so the power cord from the pump and the tubing can go out of the container while the lid is closed. Fill the container with water and put the tubing over the tank rim to be sure that the pump is strong enough to pump the distance you require. You may have to raise the container up to reduce the head pressure. Do some one minute interval runs; this will determine how much solution you dose at a time. 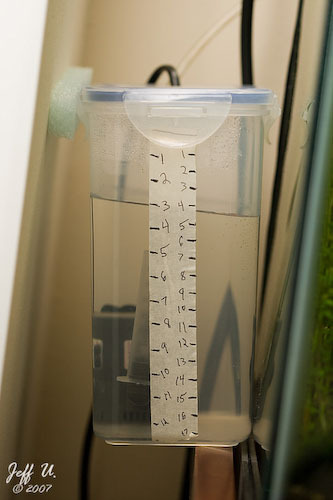 After every one minute run mark the levels of solution (water) which will tell you how many doses you can get out of your container. Also check the accuracy, your marks should be at even intervals. *Once it is set donâ€™t move the container! Based on your current dosing you need to calculate how much fertilizer needs to go into the container. Say you are dosing 1/2 teaspoon of KNO3 every other day, which would be 3.5 teaspoons to cover two weeks. You need to know how many doses your container will hold to figure how much to add; it could be a week, 2 weeks or 17 days — every container is different. Just add up what you are dosing per week and adjust accordingly. * You can also mix macros and micros together, and then just dose PO4 separate. Degraded solution: I notice a slim coating when I mix up a new solution after 17 days. Clean as necessary. Over time the tubing may need to be replaced, it can start to grow stuff and cause a restriction in the flow. When the power goes out the digital timer will reset. It may also get stuck in the on position! Use a timer with a battery backup.